Alcristal’s automatic doors can be used for projects on and remodeling of public buildings, banks, schools, convention centers, sports arenas, hospitals, airports, and in hi-tech, industrial and shopping centers, among other things. High quality sensors ensure user safety and maximum efficiency. Sliding, folding, telescopic, revolving, etc. 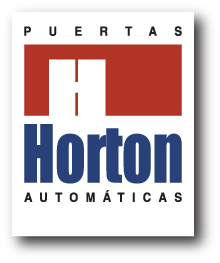 Horton is one of the industry’s most important companies worldwide. Alcristal imports from them automated systems for doors with a wide variety of choices and total guarantee of operation and post-sale services. The engineering, materials and manufacturing of Horton Automatics doors create a world-class, dependable and long-lasting product. Alcristal offers an all-in-one system that includes the door, operator and sensor. Resistant Structure: The doors can be built to sustain winds of up to 165 MPH because of their tubular structure. VIEW-SENSING SYSTEM: A sensor system based on microwaves which activate to open or close doors if it detects the presence of a person. This system also comes with an option for persons with disability. For security an infrared sensor activates a microprocessor that keeps the doors open when there is a large amount of traffic in the security zone. EFFICIENT CONSUMPTION OF ENERGY: A completely sealed door guarantees energy savings in climatic changes. APPROVED CODES: Alcristal’s doors are built according to the requirements of the American National Standards Institute (ANSI) code for pedestrians and the handicapped (ANSI A156.10). Other codes include: UL, CSA, BOCA and ICBO.